The morning 'mentioning' on Wednesday in Court 1 of the apex court witnessed some interesting remarks from Chief Justice Ranjan Gogoi. 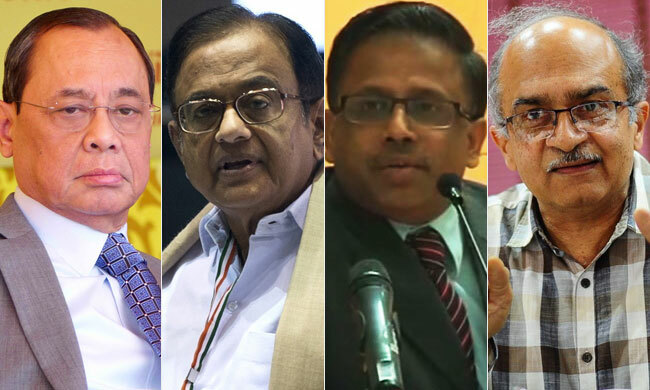 Senior Counsel K. V. Vishwanathan sought an urgent hearing on a plea by senior Congress leader P. Chidambaram's son Karti Chidambaram, who is implicated in several criminal cases, for permission to go abroad. "Who is Karthi? Karthi Chidambaram, you are saying? Let him stay where he is. We have more important matters to decide", said the Chief Justice at the outset. "We are not interested. File an application explaining your reasons...It is 10:30 and you are out of turn...", Chief Justice Gogoi cut across Mr. Vishwanathan. When the Senior Advocate submitted that the application for permission to travel, having been filed in November last year, has not been listed in the normal course and that the Registrar has recommended the 'mention', Chief Justice Gogoi asserted, "Forget the Registrar! We will see what can be done for you in the normal course"
Next, Advocate Prashant Bhushan mentioned NGO Common Cause's petition challenging M. Nageshwar Rao's appointment as the interim CBI Director- "Besides the quashing of the appointment of the interim Director, we are praying for transparency and for appropriate standards in the appointment of the CBI Director"
"What transparency? ", inquired the Chief Justice. "How the names are short listed? What is the criteria? ", replied Mr. Bhushan. "It is not possible this Friday...will come next week", conceded Chief Justice Gogoi. Thereafter, Senior Counsel P. Chidambaram 'mentioned' the matter of the Delhi High Court's stipulation of a strict time period in respect of a guarantee to the tune of Rs. 300 crores. "Go to the High Court and ask for a stay, for extension...not possible to hear it on Friday...it is only money. 300 crores is not a big amount. Maybe for the members of the bar, but not for the judges...", remarked the Chief Justice. Finally, Chief Justice Gogoi rebuked an advocate for 'mentioning' a case of a commercial arbitration dispute to which a large global corporation is party by throwing out the company's name- "the Manner in which you people mention is highly objectionable! A mere mention of the company's name would get you a hearing? You come with the assumption that the judges of the Supreme Court know what the company is? Are we sitting here with an encyclopediaWe Have More Important Matters To Decide: CJI Gogoi Disallows Urgent Mentionings of companies?"